DRESDEN, January 17, 2018. You may have thought that Germans, especially in the East, regained their freedom when the Wall came down in 1989. Nothing could be further from the truth. Communist secret police and censorship were replaced with anti-free speech laws and the grip of Cultural Marxism and the fanatical new religion of holocaust, a state religion which treats any deviations from its dogmas as heresy with the heretic deserving of fines and jail. That is why Canadian Monika Schaefer is now in prison since she was snatched attending lawyer Silvia Stolz free speech trial in Munich, January 3. 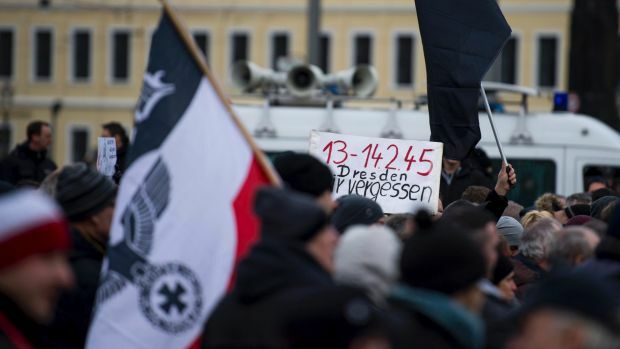 Today, German nationalists and supporters converged on Dresden for the annual commemoration of the Allied bombing of this non-military target on February 13-14, 1945. Estimates range up to 500,000 as the number of civilians blown up, buried, burned to a crisp, vapourized by terror bombing or machinegunned by strafing fighters over a three day period. One of the major speakers was Lady Michele Renouf of Britain. Part way through her speech, because she obliquely questioned the new religion of holocaust by saying the only people holocausted in Europe were the Germans (especially in the firebombing of cities like Dresden and Hamburg), the police shut the rally down. The Sydney Morning Herald (February 19, 2018) reported: “German police are investigating an Australian-born British woman for suspected incitement after she questioned the Holocaust during a far-right protest in the eastern city of Dresden. A spokeswoman for Dresden police says Michele Renouf was one of two people being investigated for remarks made at the … i rally on Saturday commemorating those killed in the 1945 Allied bombing of the city. Videos of the rally posted online show Renouf saying the only Holocaust perpetrated in Europe was against German civilians. Publicly denying the … murder of an estimated six million Jews is a criminal offence in Germany. This entry was posted in Uncategorized and tagged Alfred Scahaefer., dresden, holocaust, Lady Michele Renouf by admin. Bookmark the permalink.